1 large tomato, thinly sliced and blotted with paper towels to remove excess moisture. Brush grill rack with oil. Preheat grill to medium heat. For charcoal, place the rack 3 to 4 inches above the coals. Dust the surface of a large baking sheet with cornmeal. Shape the dough into a 10-12 inch circle or rectangle that is 1/4-inch thick. Take care to maintain an even thickness. Blend oil and 1 Tbsp chopped basil leaves. Place basil/oil mixture, shredded cheeses, tomatoes, garlic and fresh basil chiffonade on a platter and place near the grill. Carefully lift dough and drape over grill rack. Within a minute or two, the dough will begin to puff, the underside will firm up and grill marks will appear. Using tongs flip the crust over. Brush 1/2 of basil/oil mixture over pizza crust to within 1/2-inch of the outer edge. 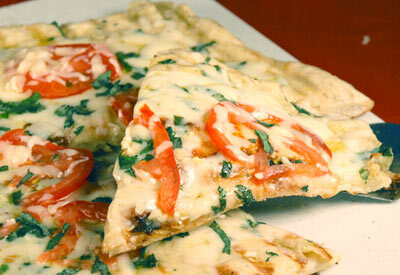 Scatter mozzarella and parmesan cheeses evenly over crust. Add tomato slices and garlic. Drizzle remaining basil/oil mixture over crust if desired. Continue to grill another 4 to 5 minutes until cheeses are melted and grill marks begin to appear on the underside of the crust. Scatter basil chiffonade over crust and remove from heat. Slice and serve immediately.